AmberCore DC is scalable. Second phase of data center offers additional 826 racks (3MW IT), up to 1652 racks (6MW IT) when DC is fully fitted. Long term scaling is planned up to 80MW. KyotoCooling System used as cooling technology. The KyotoCooling system provides cooling via rotation of thermal wheel vented both by cool outside air and warm return air from the data hall. Application of this technology and other solutions will result in PUE=1.25. AmberCore Data Center integrates advanced security systems. UPS system and diesel generators ensure non-stop operation during unlikely main power failures. Fire protection and extinguishing system are being deployed along with other security systems including: CCTV, anti-burglar system, access control and 24/7 surveillance of security personnel. Tier 1 Basic technical support service “Remote/Smart Hands” is offered on a 24/7 basis and is available to provide support for first-line maintenance situations. As an added business value, AmberCore DC provides a free monthly remote hands package. First-line maintenance situations include immediate trouble shooting such as power cycling units or altering network connections. Initial (non-live) equipment installation within cabinets/racks (commonly referred to as “rack and stack” service). 1000m2 of office space at DC is available for your on site operations. 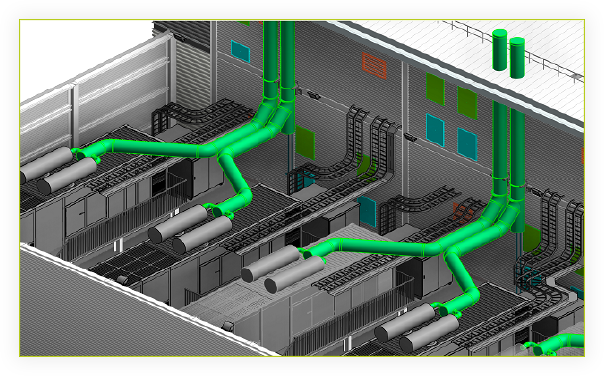 Engineers are welcome to use two dedicated build/test rooms (cooled up to 20kW each) for their best convenience.